Two flavors that to me say spring like no other is citrus and tropical. I was in the mood to try out a new cupcake when I thought about making a coconut cupcake. To take it one step further in the spring flavor department, I figured a filling would be good. That brought to mind a song I heard once when I was only 6: “Put the Lime in the Coconut.” There was my answer for the filing: lime curd. 1 cup So Delicious Original Culinary Coconut Milk. Preheat oven to 350. Line a cupcake tin with liners and set aside. In a small bowl, combine flours, starches, xanthum gum, salt, baking powder, and soda. In a large bowl, beat together margarine, coconut oil, and sugar until combined. Mix in extracts and applesauce mixture. Add half of coconut milk, then mix in half of the dry ingredients. Repeat with remaining coconut milk and dry ingredients, mixing until fully combined. Fill lined cupcake tins 3/4 full and bake in preheated oven for 15-18 minutes or until a toothpick inserted into the center comes out clean. Cool for 5 minutes in pan and then transfer to a cooling rack. In a small bowl, stir together lime juice and cornstarch until cornstarch is dissolved. In a saucepan, bring So Delicious Coconut Milk and sugar to a boil. Slowly pour in cornstarch mixture, whisking continuously, until thickened. Remove from heat and stir in lime zest. Let cool slightly, then transfer mixture to a piping bag fit with a large round tip. In a large bowl cream together coconut extract, salt, margarine, and shortening together. Slowly beat in powdered sugar. Add coconut milk and beat until nice and creamy. There are two ways that I have assembled these cupcakes. With one way, I take an apple corer and remove a portion of the center of the cupcake (being sure to not to go through the bottom). 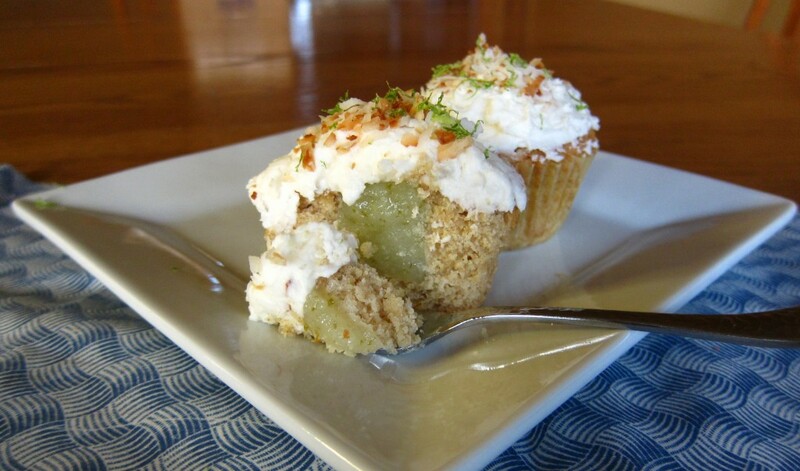 Fill cupcakes with lime curd. The second way, I put a large round tip on the end of a piping bag, insert the tip into the center of the cupcake a little over halfway down. Squeeze in a small amount of filling while pulling the tip up. Frost with coconut frosting. I find using a piping bag is easiest. Top with toasted coconut and lime zest if desired. You have to admit, that any time you hear someone say the phrase “Let it Go,” you starting singing (whether in your head or out loud) the popular song from Frozen. For me, whenever I hear someone say “Now let me get this straight,” I think of this song and video and it makes me chuckle every time (not only because the lyrics are ridiculous, but because the dance is equal in ridiculousness). For everybody’s sake, the video has been shortened significantly. I figure since this is over 20 years old, the people in the video are likely unrecognizable so I hopefully won’t get in trouble for posting it (especially since my uncle is wearing parachute pants).